Ti’s the season for pumpkin and miso butter and so I combined the two and came up with this Pan Fried Miso Butter Pumpkin. 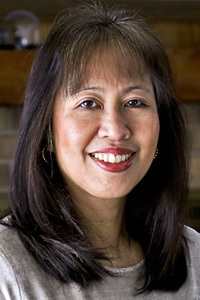 Miso butter is all the rage these days and I was curious as to the taste. It was surprisingly good! I even licked the forked I used to mix the miso and butter with….mmm! When cooking pumpkin, be sure to use small sugar or pie pumpkins and not those huge carving pumpkins. Sugar or pie pumpkins are grown specifically for eating. They have a sweeter and more tender flesh. They average between 3 to 5 pounds. I always choose the smaller ones as it is perfect for one meal. Since this was my first time making miso butter, I kept it simple without additional flavorings. I used an equal portion of miso and butter and a little sugar to round off the taste as miso can be quite salty. The amount of sugar can be easily adjusted to suit one’s preference. I actually made this Pan Fried Miso Butter Pumpkin dish twice. The first time I cut the pumpkin into wedges and roasted them in the oven. It turned out to be a little soggy because pumpkin cooks relatively quickly and there was not enough time for it to dry out in the oven. I ended up transferring them to the pan on the stove. At that point they were quite soft and broke into smaller pieces but it was still very tasty. I decided to give it a second try. This time, I cooked them in a non-stick pan on the stove at medium low heat for about 5 minutes on one side before flipping them over for another 5 minutes. It was the right thing to do. The cubed pumpkin browned nicely and the smell was just fantastic! I had a hard time stopping myself from eating one cube after another. They were a little “addicting” and so good fresh out of the pan. They are best eaten immediately. 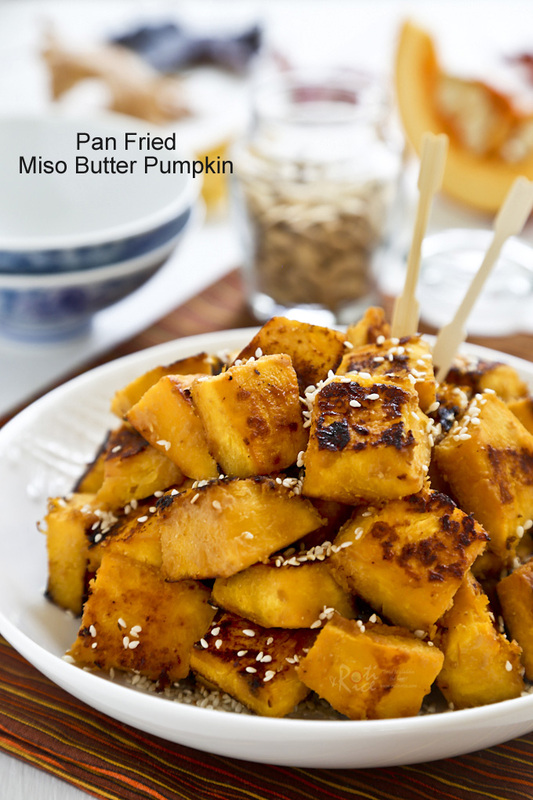 Fragrantly delicious and "addicting" Pan Fried Miso Butter Pumpkin sprinkled with toasted sesame seeds. Great as a snack or side dish. Place pumpkin cubes in a large bowl. Melt butter in a small pan. Blend in miso and sugar until incorporated. Pour miso butter over pumpkin and mix with a spatula. 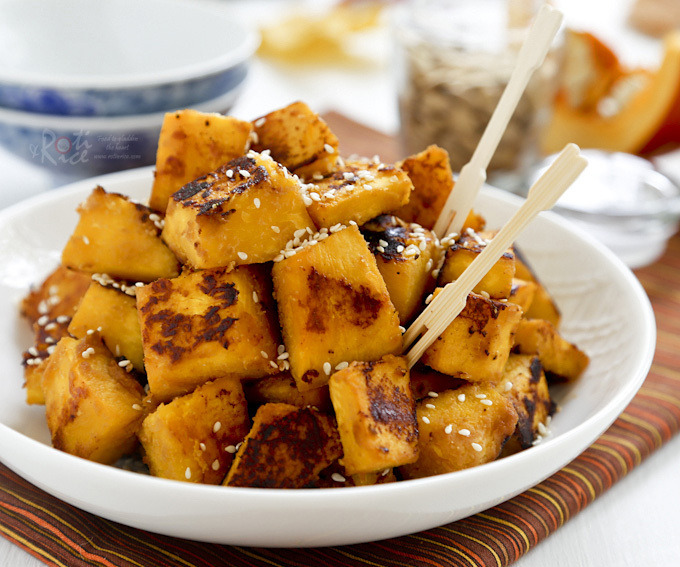 Pumpkin cubes should be well coated with miso butter. Heat a large non-stick fry pan over medium heat. Place a layer of pumpkin in the pan and fry for about 5 minutes. Flip the cubes over and continue to fry for another 5 minutes. Fry in two batches if necessary. 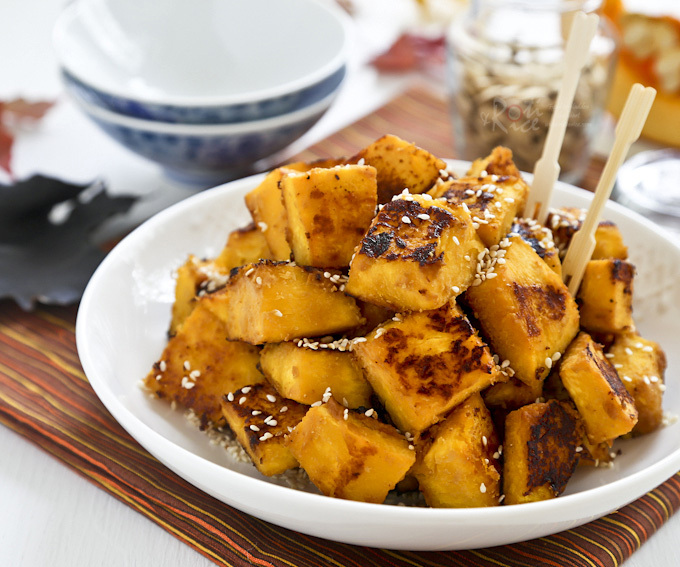 Transfer pan fried pumpkin to a dish and sprinkle with toasted sesame seeds.